gringa.org: Order in the Blog! Yes, yes, I know. Sorry about the long absence. Let's get back on the horse, shall we? Just over a month ago, I optimistically mused "this mother's day gift may be done before April!". When will I learn not to say things like that? 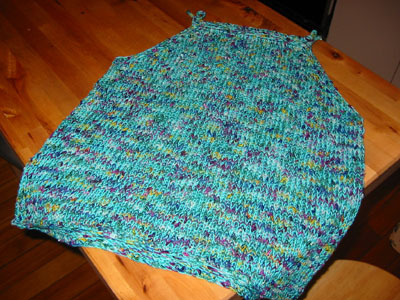 Here's the quick and dirty: I finished the knitting, and seamed the tank. I got out a crochet hook to do the edging and the straps, but when I started it looked all wrong. I ripped out the edging and tried again -- still not right. Then it came back to me. When I made my tank, I did the edging as instructed in the pattern. Then I was shown a better way to do it so I ripped it all out and did it again with much cleaner results. I couldn't remember the method I ended up using, but surely I could get help again, right? Except.... oh, yeah. The person who helped with my tank's edging was my mom. So, with Alison as a co-conspirator, when my parents came to visit last weekend I made up a story that somebody at Knitsmiths asked how I did the edging on my Waikiki tank. Could she possibly show me again? Of course she could. With that riddle solved, the last obstacle to completing Operation Mothers' Day Tank was removed. Nevermind that I ended up ripping back to the armholes twice in the week after I re-mastered the edging -- that seems much less painful now that it's all blocked, pretty and ready to be presented this Sunday!